That was the name of the press release that AT&T put out the other day to announce its new data pricing plans. Doesn’t that sound altruistic of them? They’re a company with heart, and they want to make sure that they’re there to help you! Lets take a look at these new plans. DataPlus – The DataPlus program gives you a laughable 200 MB of data a month. This plan will cost you $15.00, and if you go over that allotment AT&T will charge you $15.00 for an additional 200 MB. So say you just ran 201 MB, you end up paying $30, or $5.00 more than the 2 GB plan the company is now offering. AT&T says this plan is “enough to send/receive 1,000 emails (no attachments), plus send/receive 150 emails with attachments, plus view 400 Web pages, plus post 50 photos on social media sites, plus watch 20 minutes of streaming video.” While there will be a meter and text message notifications to alert you when you are eating up your bandwidth, you could blow through this amount of data in one busy night at a party or a concert. I honestly don’t know anyone that could survive on 6.66 MB of data per day in a 30 day month. Admittedly, my friends tend to be all tech savvy people, but when I broke this down for my UPS drive, even he laughed. DataPro – This is probably the plan most people will go for, but it is still only 2 GB of data a month for $25 a month. This plan is supposed to be “enough to send/receive 10,000 emails (no attachments), plus send/receive 1,500 emails with attachments, plus view 4,000 Web pages, plus post 500 photos to social media sites, plus watch 200 minutes of streaming video.” AT&T goes on to say that 98 percent of its customers use less than 2 GB a month, so you have to ask why they don’t just talk to those other two percent? Why are they issuing new plans that will affect all customers? 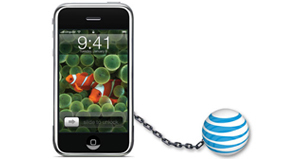 Tethering – iPhone users have been waiting years for tethering, and while AT&T says you can stick to your old plans, if you want to use tethering once it shows up with iPhone OS 4, you are required to be using DataPro, and then tethering will cost you an extra $30 a month … which means it will cost you $55 to access your 2 GB of data on your laptop. What was that again about making it more affordable for more people, AT&T? It will now cost more to tether than it would have under the old plan. Woo-hoo! 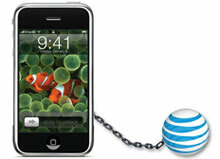 So why does all this speak to it being time for Apple to leave AT&T? We’re going to be getting multi-tasking on the iPhone at last. People have been waiting for the day they can leave their instant messenger programs on in the background as they do other things. You constantly hear of how people can’t wait to have Pandora running as they do their e-mail, this will be another benefit of multi-tasking. You all do realize under these new data plans all of that pretty much just went away as soon as it arrived, right? AT&T goes to great lengths to tell you how you can still be unlimited on Wi-Fi, and the data plans will still give you access to its 20,000 hotspots, but isn’t the point of devices such as this to allow you to be mobile? Say on your commutes to-and-from work, going on road trips, working out in the field, etc? Now you have a giant weight hanging over your head like those anvils in crtoons, knowing it could fall on your head at any moment. So long as Steve Jobs continues to allow AT&T to be its exclusive carrier in the United States, people will associate these practices and policies with Apple. And considering this is coming out just as the iPhone HD is due to hit, which will finally deliver multi-tasking and tethering, doesn’t this all seem kind of like, “Look at the pretty new features you really can’t use!”? Once again I am shown why I have refused to have an iPhone all this time, and it can be summed up as “AT&T”.